This was a brilliant story, by an amazing storyteller. It's a mix of dark humour and gritty reality but it kept me hooked through to the end. I know some people have complained there's no plot as such but I couldn't disagree more! The characters made the story move forwards, they told their part of their lives in Pagford and you watched as the town morphed and transitioned into something new each chapter. I can't really say anymore because I think you have to read it to really understand the book. The summary is just a setting, a beginner story to put you into the centre of Pagford life and it all spirals off from there. 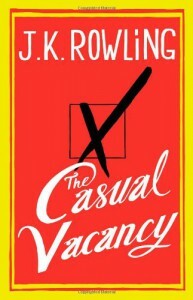 Rowling seems to have this special talent of identifying human emotions and actions that we all thought we kept hidden and displays them for everyone to see in 'The Casual Vacancy' - some truly horrible (domestic abuse, neglect) and some we may all have been guilty of at some point (ignorance, snobbish attitudes). It's a very powerful book and I'm still assessing my emotions after it came to an end. A definite recommended read.